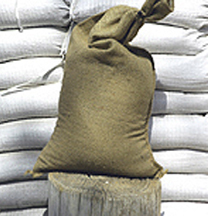 Filled untreated burlap bags, avg. 35 lb. - 1-74 count, 14"x26"
Untreated burlap bags are 10 oz., 100% jute with no additives. Biodegradable and compostable. These may best used in dry environments where they won't be exposed to sustained moisture or standing water. If allowed to get wet, their lifespan can be significantly extended by turning them periodically & giving them a chance to dry. Weight averages 30-35 lbs. each. One full pallet = 75 bags, one truckload (20 pallets) = 1,500 bags. Individually, you pick up - $4.00 each / delivered (30 mile radius ABQ) - $5.00 each, up to 50 bags. Over 50 bags or out of town delivery, call for a quote. Over 10 pallets - call for quote. Email or call to order. Reasonable lead time may apply. Rush orders (24/7) available with surcharge.